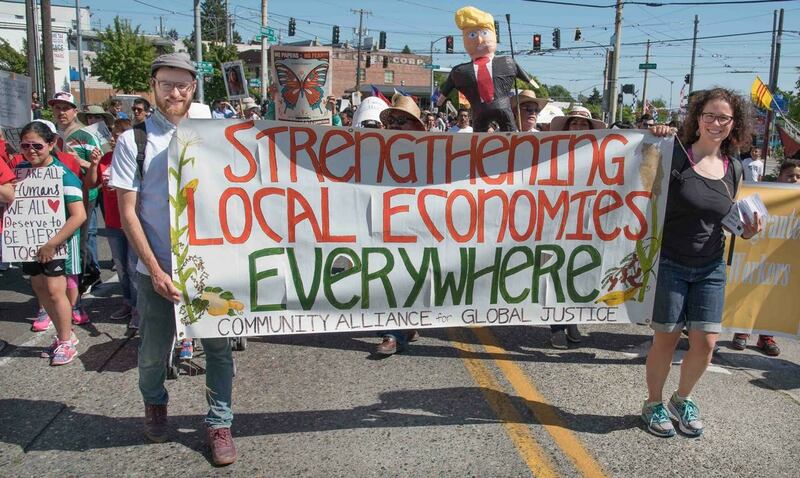 Ross Kirshenbaum (left) and Jenny McIntosh (right) march down Seattle streets with CAGJ banner on May Day 2016. 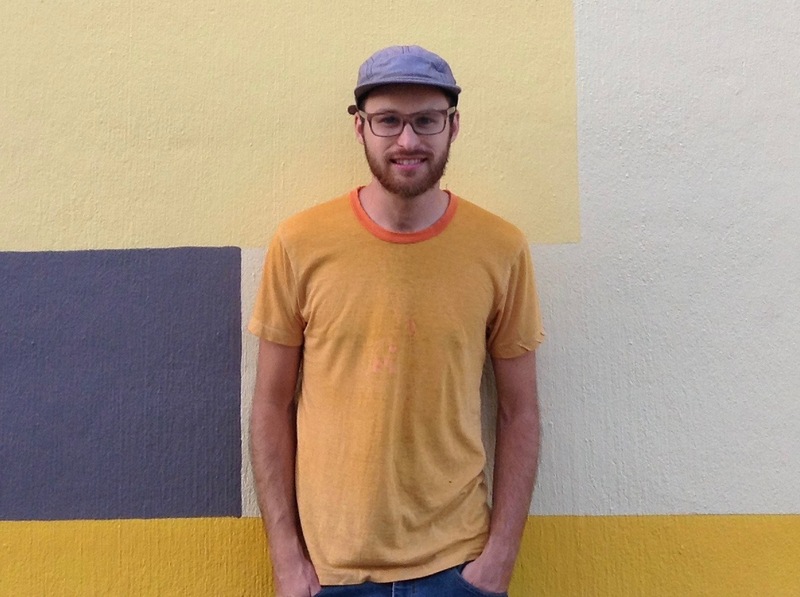 My name is Ross Kirshenbaum, I have co-chaired the Food Justice Project for nearly two years now. I first learned about CAGJ back in 2008 when my school, Seattle Central, was taken over by a Teach-In hosted by CAGJ, with free, radical food justice workshops featuring a variety of local organizations. I was so inspired by this event that I decided to get involved with CAGJ, and here I am 8 years later…more radical than ever. I would like to take a moment to ask you to commit a radical act right now and renew your membership with CAGJ, or make your first membership donation! Will you make a one-time donation, or become a Sustaining Member, to keep us going in 2017? Members keep us active! I have always considered myself a politically aware person, but not always politically active. I credit CAGJ for largely influencing that change in me. I think I used to be cynical…I didn’t think protesting could make a difference…I didn’t understand the roots of many issues…I didn’t understand how interconnected everything was. CAGJ truly shaped my political analysis. They presented research that really broke down the issues for me. I could see the connection between trade agreements and migration, between racism and food deserts…And I woke up politically. When you understand the roots of the issues, you understand how to act to transform them. The political moment we are in right now demands us to take action in smart, meaningful and courageous ways. Over the past couple of weeks, I have been inspired by the sheer number of people who, for the very first time, want to get involved politically. CAGJ has an invaluable role to play in this moment because our work focuses on developing the analysis of new leaders. We are a small, agile organization that knows how to win! We are not beholden to foundations or government grants. Our strength is in our Members, and that means YOU! We need you right now more than ever! We are asking you to make a donation of $5, $10, $25, $100…whatever you can afford. Your contribution helps us build new food and environmental leaders, support front line communities, and work in solidarity and coordinated efforts for collective liberation. Thank you so much for being a Member of CAGJ and being a part of this important work. P.S. Sustaining Members agree to have funds automatically deducted from their account, allowing CAGJ peace of mind, and more time to focus on organizing. If you are not already a Sustainer Member, please consider becoming one today, at $15/month, or whatever amount you can afford! Just click the box next to “I want to contribute this amount every month”. P.P.S. CAGJ’s annual Holiday Party is Saturday December 17, 4-7pm. Join in community to celebrate our collective work and gain strength for the coming year. Fair Trade & Local Gifts that benefit CAGJ available for sale. RSVP for more info. 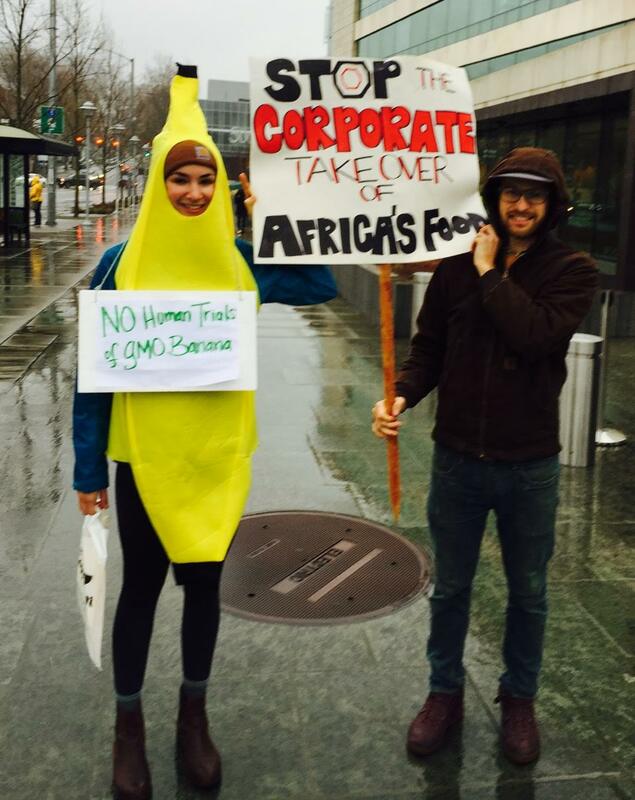 Emma Shorr (in banana costume) and Ross Kirshenbaum protest the Gates-funded human feeding trials of GM bananas and their program to push forward GM bananas in Uganda. From AGRA Watch action in February 2016.